Click the button below to add the EPANEL-MS4448PAE Magnum MS4448PAE 120/240VAC Inverter mounted on E-Panel to your wish list. 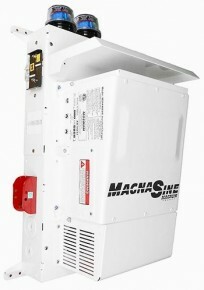 E-Panels are an accessory that completes the installation of a single Magnum inverter in one tidy package. E-Panels contain all the necessary components to make your inverter installation easy, turn-key and most importantly, electrical code compliant. DC over-current protection (as in a circuit breaker or fuse) as the batteries have the ability to deliver thousands of amps of current if short circuited. AC wiring connections to and from the inverter must also have circuit breakers and disconnects. If a solar charge controller is included, it must have DC rated circuit breakers on both the input and the output. All electrical equipment must be connected to a common earth ground. Optional lighting protection can be added to protect the solar equipment from surges caused by lightning. With a hinged door holding the inverter, E-Panels provide easy access to wiring terminals, allowing the AC input, output and battery connections to be made on site, and are cETL approved for Canadian installations. It includes DC rated circuit breakers for both solar (when applicable) and inverter DC cables. Extra slots are available for additional breakers. The master DC disconnect is provided to meet code, and provides instant shutdown of your power system. E-Panels are custom built to match your home or cottage needs. First, select your battery voltage, and inverter size. Some models are 120VAC, others provide both 240 and 120VAC. Add optional charge controllers, battery monitoring and surge/lightning protection. These will be installed and prewired, then crated for delivery to your project.